Please avoid using acronyms or articles such as “the” or “a” when entering your district’s name. Are the schools in your district using pencil and paper to track visitors or are you looking to replace your current visitor management provider? Are there currently any district-mandated visitor management policies in place? Are you looking for general information, a product demonstration, or pricing information? Is your organization using pencil and paper to track visitors or are you looking to replace your current visitor management provider? Are you looking for general information, a product demonstration, or pricing information? Please select the visitor management configuration that meets your needs. 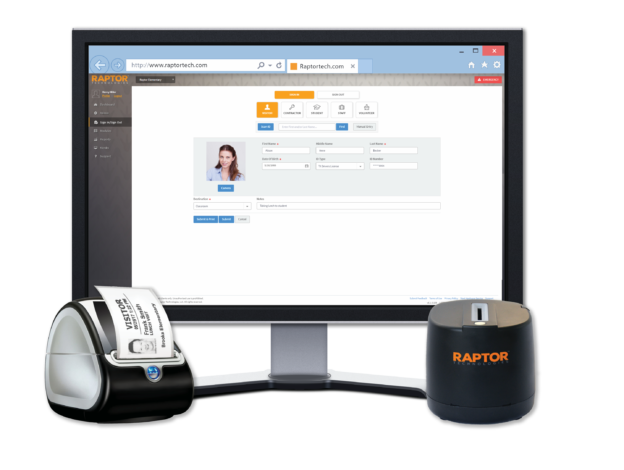 Includes an ID scanner, a badge printer, 1,200 adhesive visitor badges, shipping and handling, and remote installation and training for you and your staff. First year annual software access fee of $540 is included. Track student tardies in Raptor and print non-adhesive tardy slips. Includes dual printer and 1,200 non-adhesive tardy slips. No additional annual fee. Please submit this form to receive your official quote via Email. Are you a current Raptor customer in need of training or technical support?